Literary Map of NYC archives NYC locations in literature and places them on an interactive map. Location plays an important role in literature. It sets a tone, conveys an emotion and connects the reader to the text. A place tells a story, and a story tells about a place. It is this interconnection between literature and geographical location that we explore at Literary Map of NYC. We gather literary passages that describe NYC locations. We have registered 406 passages from a variety of literary works so far. And the archive is growing! 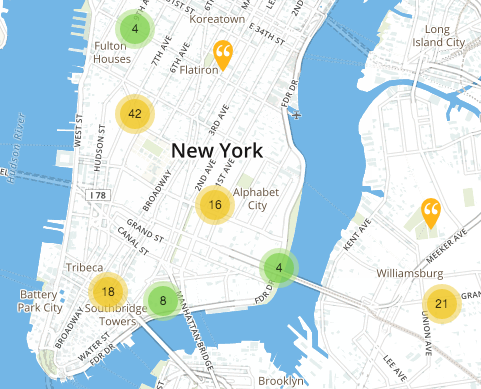 Our interactive map lets you explore the city of New York. Discover literary quotes in the streets of NYC. Rediscover the city through a fictional layer. Enjoy!